^ Wagner, Dennis. 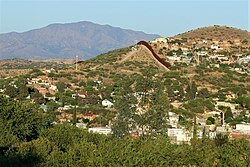 Competing interests divide new Arizona town. The Arizona Republic. 2010-04-12 [2015-10-07]. （原始内容存档于2013-01-02）. ^ Article 13, Section 2. Arizona Constitution. Arizona State Legislature. [2015-10-07]. （原始内容存档于2012-07-19）. ^ Article 13, Section 1. Arizona Constitution. Arizona State Legislature. [2015-10-07]. （原始内容存档于2012-07-21）. ^ Arizona Revised Statutes §9-101. Incorporation; definition. Arizona State Legislature. [2015-10-07]. （原始内容存档于2012-07-24）. ^ Arizona Revised Statutes §9-101.01. Incorporation, urbanized area. Arizona State Legislature. [2015-10-07]. （原始内容存档于2012-07-29）. ^ Arizona Revised Statutes §9-281. Adoption procedure; board of freeholders; election. Arizona State Legislature. [2015-10-07]. （原始内容存档于2012-07-19）. ^ Arizona Revised Statutes §9-276. Additional powers of cities. Arizona State Legislature. [2015-10-07]. （原始内容存档于2012-07-18）. ^ Arizona Revised Statutes §9-121. Consolidation of towns. Arizona State Legislature. [2015-10-07]. （原始内容存档于2012-07-29）. ^ Arizona Revised Statutes §9-122. Unification of a city and a town. Arizona State Legislature. [2015-10-07]. （原始内容存档于2012-08-02）. ^ Arizona Revised Statutes §9-271. Procedure for change; city officers. Arizona State Legislature. [2015-10-07]. （原始内容存档于2012-08-02）. ^ Out of the Ashes: The History of the City of Phoenix. City of Phoenix. [2014-02-14]. （原始内容存档于2014-10-19）. ^ About the League: Member Cities and Towns. Arizona League of Cities and Towns. [2012-02-14]. （原始内容存档于2012-02-14）. ^ Annual Estimates of the Population for Incorporated Places in Arizona. United States Census Bureau. 2009-07-07 [2009-07-21]. （原始内容存档于2010-12-23）. ^ 14.0 14.1 Population, Housing Units, Area, and Density: 2010 - State -- Place, 2010 Census Summary File 1. United States Census Bureau. [2015-10-07]. ^ Community Profiles. Arizona Department of Commerce. [2015-10-07]. （原始内容存档于2015-08-18）.